There are many different neuromuscular conditions in which weakness of the breathing muscles requires monitoring and treatment and may eventually need some form of mechanical ventilation. In Duchenne muscular dystrophy most boys/young men will need to start using a ventilator in their late teens to early twenties. In some other conditions such as the congenital muscular dystrophies and myopathies and spinal muscular atrophy, ventilation may be needed in infancy or childhood. People with other, late onset conditions may require some ventilator assistance only much later in life. Starting on ventilation is often a daunting transition for people with muscle disease. However, once you have settled into the new routine of ventilation you will find that you feel healthier and have more energy, so all of the hard work to make it comfortable will be worth it in the end. Starting ventilation promptly when it is needed may also help to avoid potential problems down the track with the heart and general health. Ventilatory assistance need not be full time. In fact, many people use it only during sleep at first, progressing to daytime use gradually, if necessary. It may also only be required for short periods such as when recovering from a chest infection or after surgery. We have put this factsheet together to help make the journey smoother but it is not meant to substitute for the advice given by your specialist health care team. How do I know when to start ventilation? If any of these symptoms start to appear, you may need sooner than scheduled monitoring by your doctor. How often breathing function tests will be required depends on the neuromuscular condition and the stage of progression. Your doctor will advise how often to attend clinic for respiratory monitoring. In Duchenne MD, yearly assessment is recommended while still walking. This usually just involves forced vital capacity (FVC) measurements in which a deep breath is exhaled completely into a spirometer machine. When no longer walking, monitoring may be needed more frequently, especially if any of the above listed symptoms are present. More detailed tests may also be done including measurements of cough strength and oxygen levels during sleep. Is there anything that can be done to delay the need for ventilation? Deep breathing and coughing should be encouraged because these are the body’s natural mechanisms for clearing the lungs of mucus accumulation. Sighing and huffing are practiced along with the use of respiratory toys (incentive spirometer). The spirometer provides a goal volume for a deep breath and the aim is to hold that volume for 10 or 15 seconds. Fifteen to twenty deep breaths are encouraged four to six times a day. Keeping as physically fit as possible, while being careful not to overdo it, is recommended. Swimming and hydrotherapy are popular forms of exercise for people with MD, although some people with respiratory weakness find breathing more difficult when immersed in water up to their chest. Some people with mild respiratory impairment find that singing or playing a wind instrument helps. Keep immunisations up to date – annually for influenza and every five years for the pneumococcal vaccine. Respiratory infections and asthma must be treated appropriately and assistance with coughing may be needed. Avoid exposure to respiratory infections wherever possible. Drink plenty of fluids to keep mucous thin, maintain a good diet and avoid becoming overweight. Avoid cough suppressants, allergens and irritants. Chest physiotherapy (chest percussion and gravity drainage) may be used to loosen and mobilise mucus in the airways, especially during a respiratory illness. Clapping on the chest over certain areas of the lung will jar mucus loose. Inclining the body in certain positions will encourage mucus drainage of that area of the lung by gravity. Deep breathing and coughing is required during and after this kind of chest physical therapy. Doctors and/or physiotherapists at the muscle clinic can assist parents in learning chest physiotherapy. See also information about CoughAssist machines under “What other equipment might I need?” below. Taking steroid medication (prednisone or deflazacort) may delay the need for ventilation by several years in individuals with Duchenne MD, but the benefits and risks of this medication must be considered on a case by case basis. Correcting curvature of the spine (scoliosis) with surgery at the optimal time can also improve respiratory function. Frog breathing, or technically speaking, glossopharyngeal breathing (GPB) is a learned skill that can be used as a substitute (voluntary) method of breathing. This technique can be used even when there is total paralysis of the respiratory muscles but the muscles of the tongue, soft palate, pharynx and larynx must be functional. It will not replace the need for ventilation but can be useful for emergencies, transfers, chest expansion, coughing and to permit time away from the ventilator. In a few cases, individuals can remain off the respirator for extended periods of time, and in some situations all day if the individual’s skills are highly developed. Frog breathing uses the muscles of the tongue (the glossa) and the throat (pharyngeal muscles) to force air into the trachea and lungs through a repetitious process. This process involves using the tongue and throat muscles as a pumping mechanism to force air into the lungs (see diagram below). This pumping action is sometimes referred to as a stroke. A proficient frog breather will average approximately 8 or 9 breaths per minute with each breath requiring 12 – 15 strokes. This requires considerable physical exertion, but will become easier as the muscles involved get used to it. Most individuals need considerable instruction and encouragement to learn this technique, as well as hours of practice to master it. To learn frog breathing one could use the image of inflating a brand new balloon as a metaphor – the first few breaths are the hardest and each additional attempt at inflation becomes easier as the balloon becomes more expanded. It is important to remember not to swallow, or air will enter the stomach. What types of mechanical ventilation are there? Non-invasive ventilation (NIV) is the delivery of air to the lungs via the mouth and/or nose. The attachments available include a facemask, a mouthpiece (sometimes called ‘sip ventilation’) or a nasal interface (nasal pillows or mask). Most people on full time NIV have a range of attachments available for different situations and are rotated for comfort. For example, at night a nasal or face mask is used and some prefer a mouthpiece during the day and when interacting with people as it is less intrusive. The mouthpiece is mounted on a gooseneck or a halter so that the user can grasp it with his or her mouth and take a breath when needed. BPAP (bi-level positive airway pressure) is the most common type of ventilator used for NIV. BPAP is also sometimes referred to as Bi-PAPTM (which is a brand of ventilator made by Respironics Company) or VPAPTM (variable positive pressure ventilation). BPAP ventilators have two phases of operation for each breath. A higher pressure for inhalation and a lower pressure for exhalation to improve gas exchange and maintain the airway open. 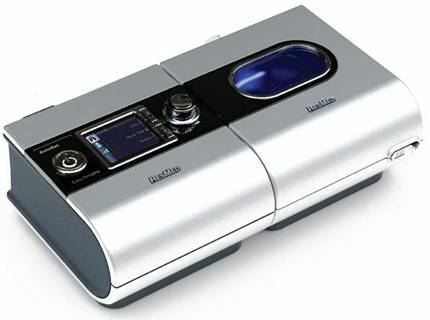 There are several types of BPAP/VPAP machines with a range of different features prescribed according to the individuals’ requirements. They are not life support devices. A slightly different machine called a volume cycled ventilator is needed for sip mouthpiece ventilation during the day. This delivers a set volume of air rather than inflating the lungs to a certain pressure. People who are ventilator dependent (> 18 hrs/day) need a more advanced life support device. They will be usually be given the same type of machine used by those with invasive ventilation. A tracheostomy is a surgical incision in the windpipe through which a tube is inserted to deliver air from a ventilator. Tracheostomies are relatively common, and used successfully by men with Duchenne MD in some countries such as Denmark, but in Australia they are usually only done when NIV is unsuccessful in alleviating respiratory failure. This is because the tracheostomy can interfere with speech and swallowing and there is a risk of infection. An advantage of tracheostomy is that secretions can be easily cleared using suction through the tracheostomy tube reducing the risk of chest infections. However, a cough assist machine (see below) can successfully minimise the incidence of chest infections in those using NIV. The tracheostomy operation is a relatively straightforward procedure which is done under general anaesthetic but like any surgical procedure carries some risk. Before discharge from hospital, carers will receive training to maintain the tracheostomy – suctioning secretions, cleaning leakages and changing dressings and tapes. A qualified person replaces tracheostomy tubes every one to two months in a hospital clinic. Invasive ventilation requires the use of a life support ventilator. These are larger and more complex than BPAP machines. They have several modes of operation, a range of alarms and an internal battery. What other equipment might I need? Most people whose respiratory muscles are weak enough to require assisted ventilation also require assisted coughing. The CoughAssist or a similar device is often recommended, not only during colds but on a daily basis, to prevent mucus build-up in the airways. Cough assistance involves simulating the natural coughing process using a mouthpiece or mask that delivers air. The machine gradually applies positive pressure to the airway followed by a rapid shift to negative pressure. In case of emergency: spare ventilator tubing and batteries should always be available. If you need your ventilator for more than 16 hours per day you should have a back-up ventilator. Please also read our factsheet “Preparing for a power failure” for more information on dealing with emergencies. If supplemental oxygen is required during a respiratory crisis, for example during illness or after injury, this must be carefully controlled because this can cause a situation where the urge to breathe is decreased. If it is necessary to give oxygen, healthcare professionals must carefully monitor blood gases and/or help the breathing with NIV at the same time. Will my eating and sleeping be affected by ventilation? Getting used to ventilation while sleeping can take some time. Perseverance is needed to find the most comfortable mask position and ventilation settings. Most of the time the NIV interface e.g. mask can be removed to eat but for more severe respiratory issues it will take practice to juggle eating and ventilation at the same time. The professionals at your respiratory clinic will be able to help you with these issues. It has been proven that ventilator use significantly increases length and quality of life for people with neuromuscular conditions. However, it may take some time to become comfortable and confident using a ventilator. We recommend making use of all the resources available to you and if possible talk to others who have already made the transition to ventilation. 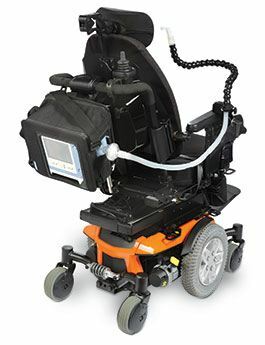 Ventilators have become small enough to attach easily to your wheelchair so that you can still go out and enjoy life with ventilation. Of course extra planning is required to make sure you have all the equipment you need and to prepare for emergencies, but once this is organised a productive, fulfilling life is possible as demonstrated by many ventilator users worldwide. Many thanks to Anne Duncan, Victorian Respiratory Support Service Outreach Coordinator at Austin Health (Heidelberg, VIC) for her help in preparing this document.